I’ve been a road tripper for literally as long as I can remember. Literally, because the first memories that I can specifically tie to a date and time are from a road trip my parents took me on from Atlanta to LA and back about a month after I turned 3. The colors of the Painted Desert, the scenery, prairie dogs outside the tent one morning, big horn sheep crossing the highway at dusk, wet-suited surfers and the cold of the Pacific (one foot in and I ran screaming- some things never change). My first conception of scale that was much bigger than I had known before- my mom saying “see the big hole, Christine?” from the windy observation deck at the meteor crater in New Mexico, my scanning the landscape for a hole such that you might plant a tomato in and then realizing that the landscape dipping vastly in front of me was “the big hole.” Road tripping the US from end to end and top to bottom and zig-zagging in between has continued to open my eyes to new things. We celebrated out wedding anniversary this weekend. My ankle and my continuing inability to walk very far or very well caused a last-minute change of plans. 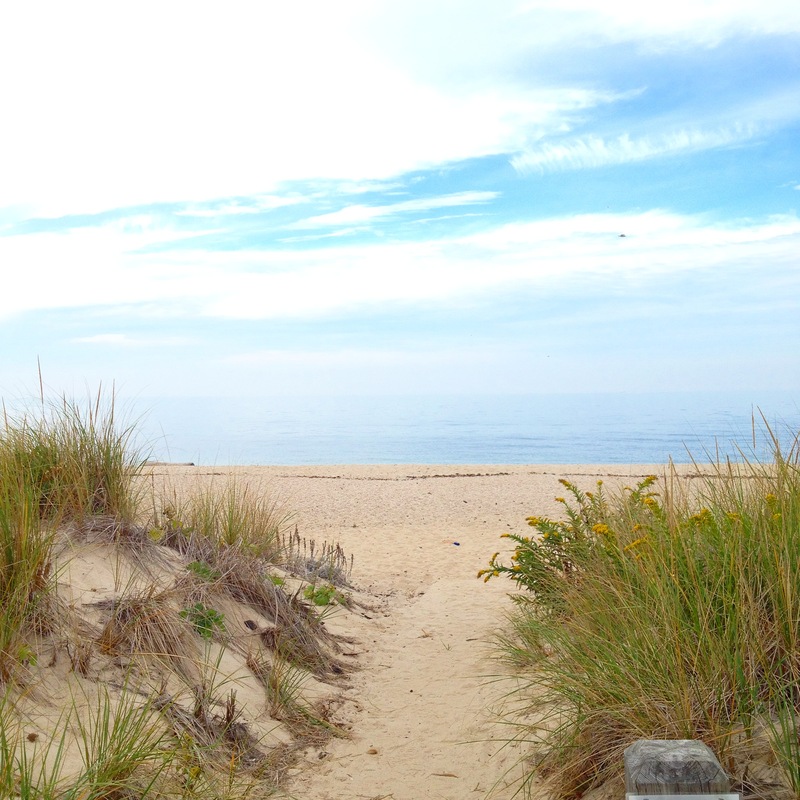 We rented a car and drove out to the east end of Long Island for a couple of days. At its eastern end, the island forks around a wide bay and several islands. 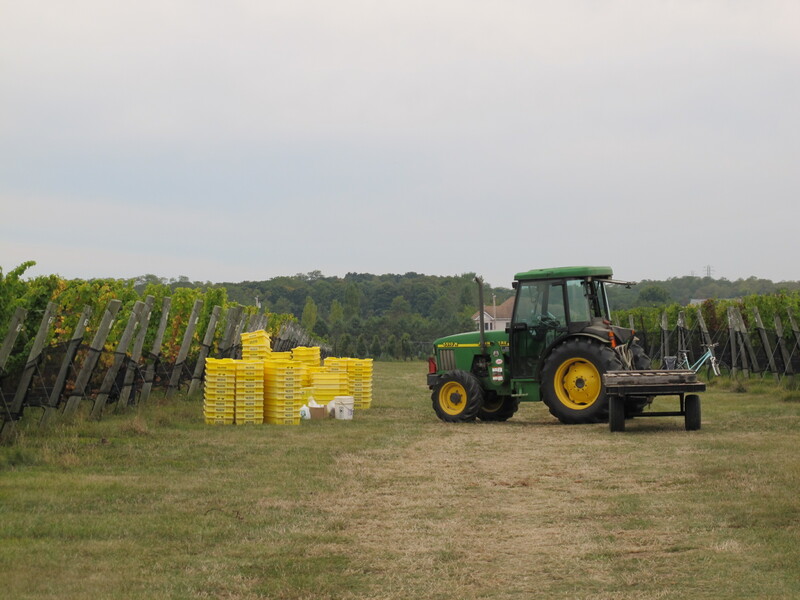 The South Fork, home to The Hamptons and Montauk, is the better known of the two, while the North Fork has been an agricultural area with a growing wine industry. 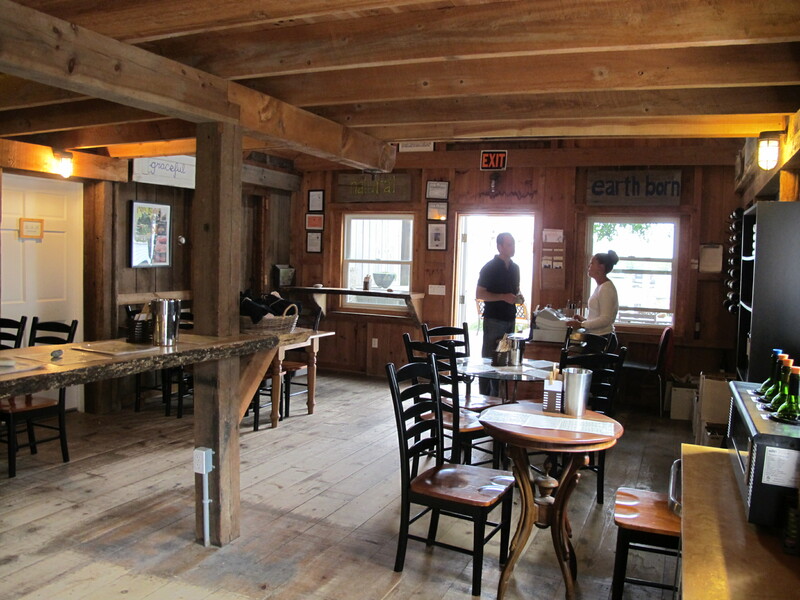 Quieter, less glitzy, the North Fork reminded me of the more laid back Sonoma County wine country in California where you were less likely to find yourself in a limo traffic jam than in neighboring Napa Valley. 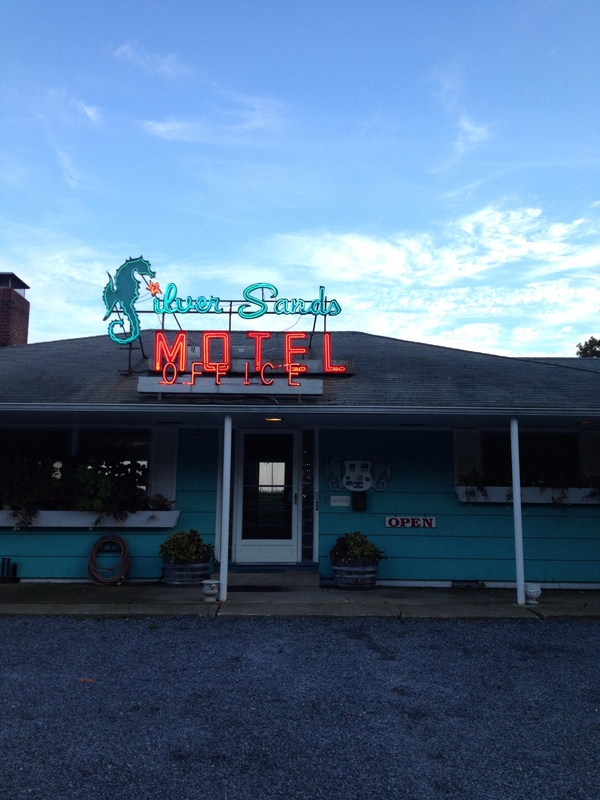 We stayed at The Silver Sands just outside Greenport, NY, a retro shabby (but very comfortable) U-shaped motel and a sprinkling of cottages beside a curl of gold beach. 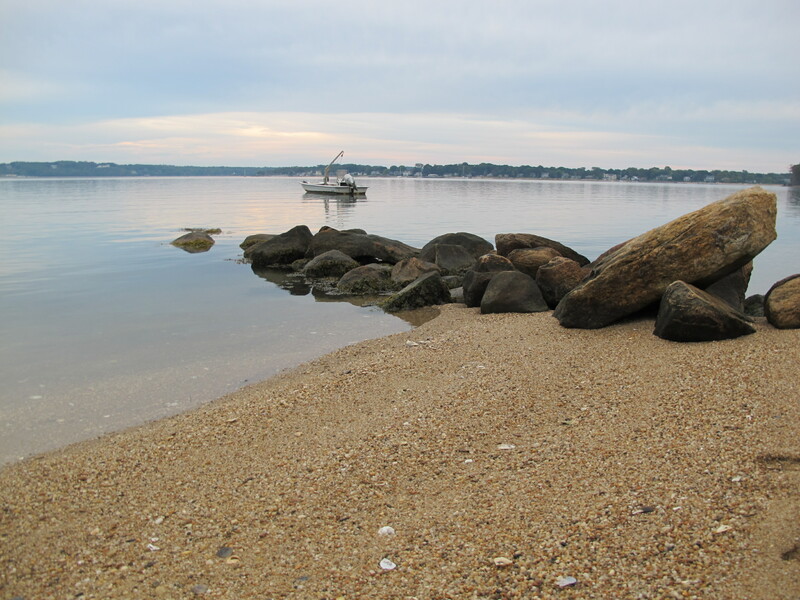 When we checked in, Elle magazine was doing a photo shoot in front of our cottage, a model in a glittery dress on a spit of rocks that reached into the clear, smooth bay. 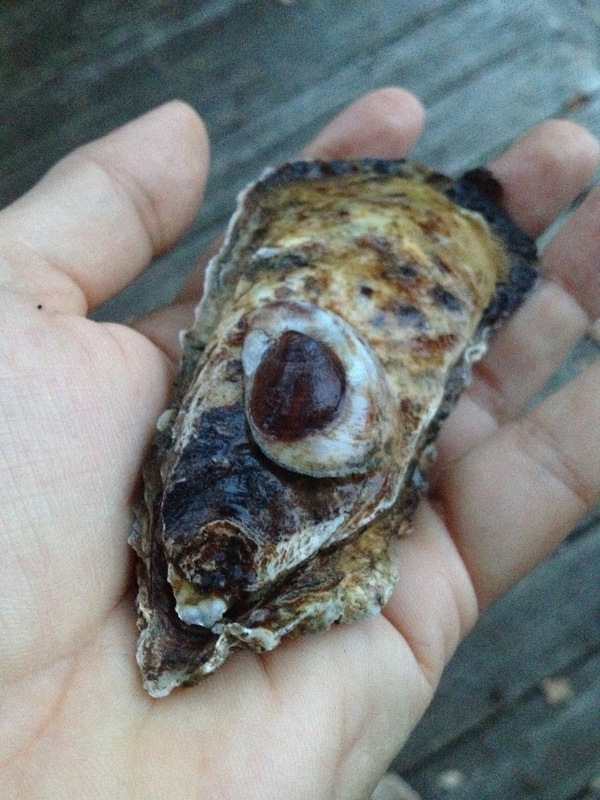 Oysters washed up into the shallows from the oyster farm next door, “so you know the water is perfect, because they have to test every week,” said the hotel manager. 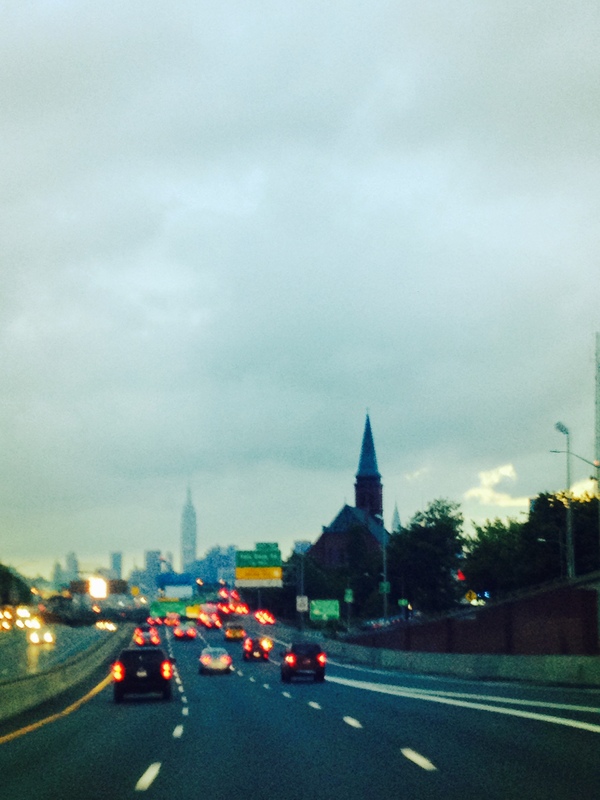 It felt incredible that we had driven through midtown Manhattan on our way here just an hour or two before. Our plan was to relax, try to eat as much seafood as we could, do some unhurried driving through the scenery, and taste some locally brewed beer and wine. 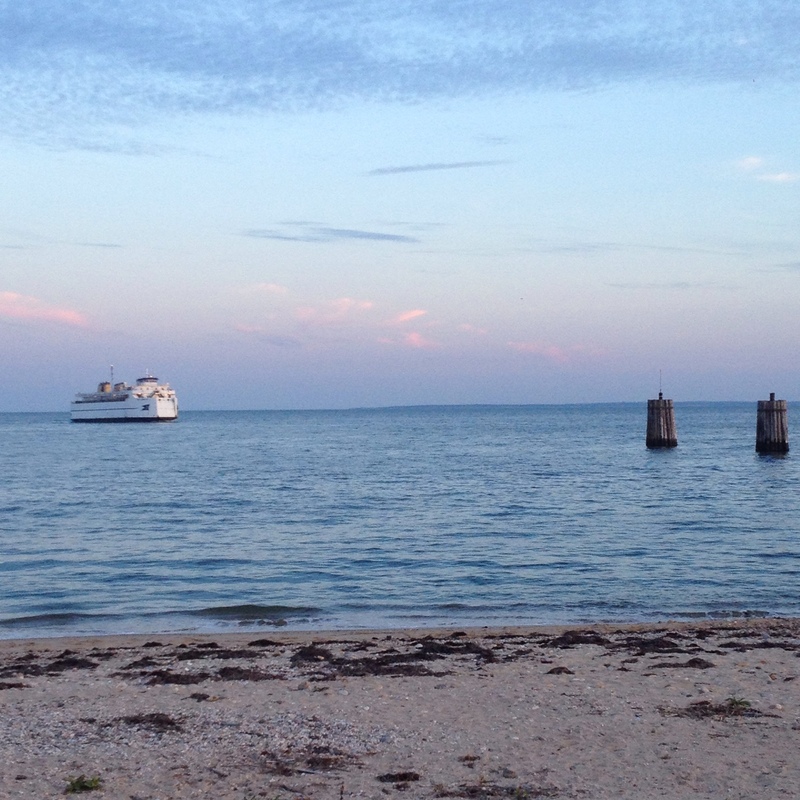 After driving up to the tip of the North Fork where Orient Point slices the Atlantic from Long Island Sound and watching the Cross Sound car ferry dock, we had dinner at a nice restaurant in Greenport, known for its locally sourced seafood and produce. I’ll confess, the downside to being me is that I not infrequently have the frustration of being underwhelemed by the food that restaurants serve me. I dislike paying a lot for food that I have made (better) at home. This was my experience: nothing I disliked or found objectionable, but I wished the food had been a little more memorable. 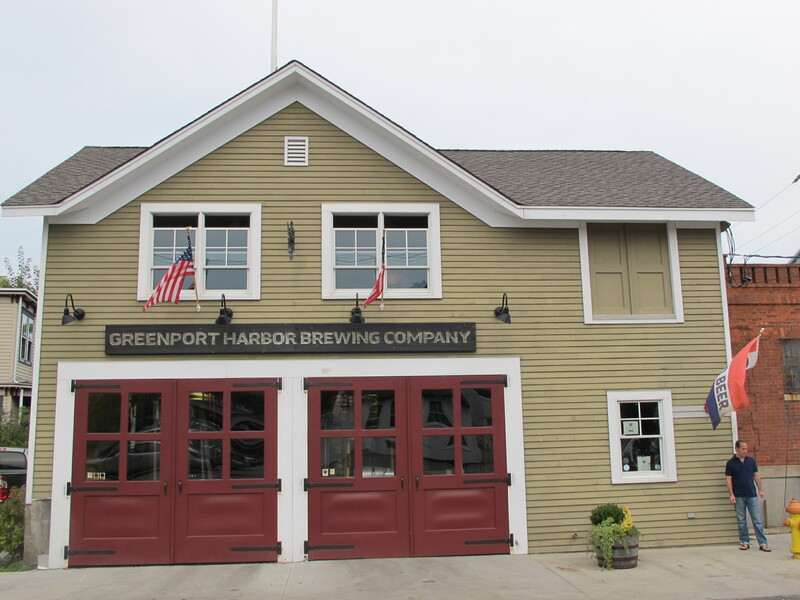 The highlight of the meal was a pair of locally brewed beers that the restaurant had on draught: Greenport Harbor Brewing Company’s Harbor Ale and Montauk Brewing’s Driftwood Ale. We noticed something that we had been discussing-the distinct regionality of beer. I really started learning and appreciating beer on the west coast. The dry climate, cool nights, the hops with their intense resinous flavor, the grapefruit and apricot and pine, all worked for me. I loved hoppy intense beers. After moving to Hoboken, I continued to look for similar styles but found that even the hoppier beer brewed around here (like Ithaca Flower Power for example) had a subtle shift in accent from what I was accustomed to in California. And when I started paying attention to the subtle variations, I began to appreciate and even look for beer that was a good east coast version of those types. I like the subtle hints of English hops that tended to be overwhelmed by the boldness of California styles, the subtle uptick in the flavor of malts; the flavor and body of the good beer I was finding here was working for me in the climate in a new way. Beer that I had not enjoyed as much when I tasted it in other parts of the world was becoming more what I craved. I started thinking about beer in terms of accents (as in “how y’all dewin’?” and “fuhgeddaboudit” accents). The subtle shifts in accent from city to city, region to region, the shift in vernacular and colloquialism is one of the things I love about travel and living all over the country. It adds a richness to discourse, the subtle hints and clues to be gathered about where someone (and their ancestors) came from. And I am beginning to find the same to be true in food and drink. The whole accent of the beer changes (as it should) based on the region in which it is made and drunk. Maybe less specifically about the earth or terrior than wine, the flavor “accent” of the brewer should come through, even if it is as subtle as my accent usually is. 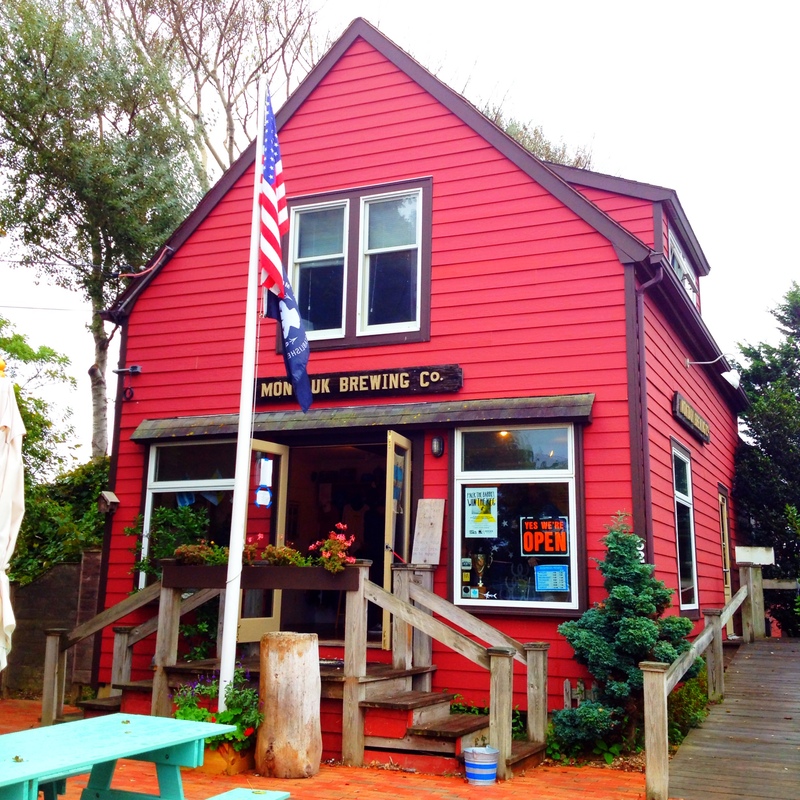 So back to the North Fork and our beer: we tasted two beers at dinner that night, same type of ale, different brewers. They were both hoppy, but with different hops emphasized. 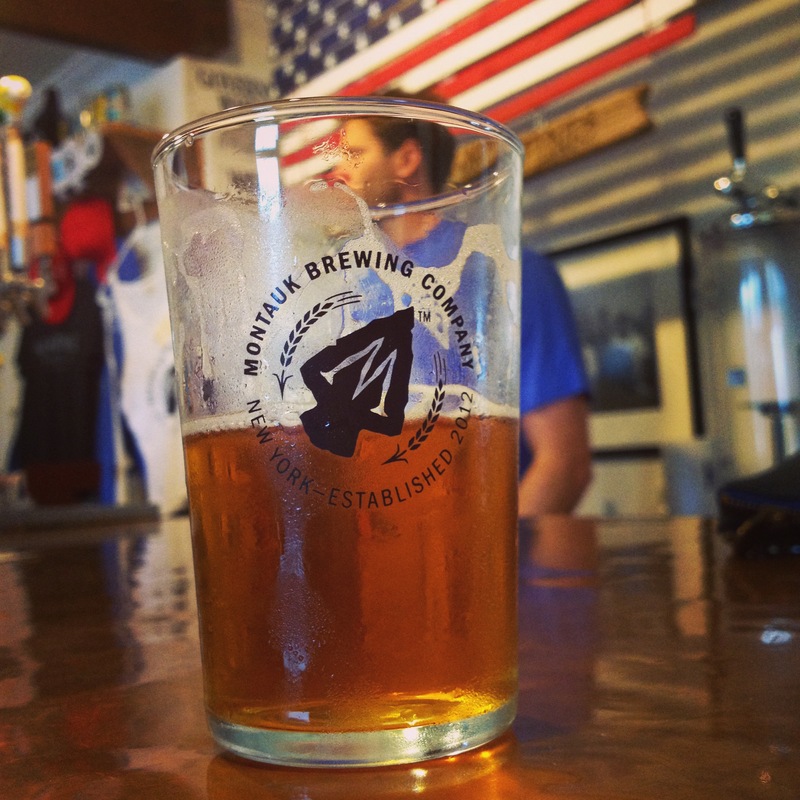 The Montauk had a little more of a caramel flavor to balance the hops. But the interesting thing to us was that they tasted like beer that belonged here. The briny air, the humidity, the hint of the winter cold to come, the beer had a far eastern Long Island accent. With this on our minds, we visited a biodynamic winery that a friend in the wine business had recommended. I was curious about Long Island wine, especially one with a reputation for being very carefully crafted like that at Shinn Estate Vineyard. Again, my familiarity with wine was cultivated in Northern California but working with wine in the New york area with a heavy emphasis on wine from Europe as well as its own reemerging wine culture has tremendously broadened my palate. 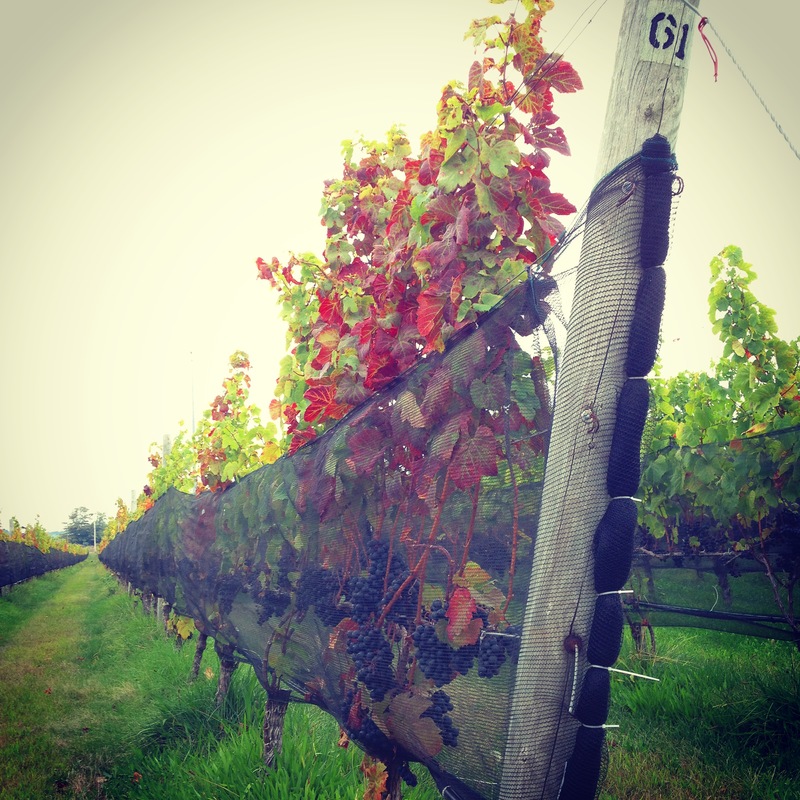 We visited Shinn Estate Vineyard on a quiet afternoon during the beginning of their harvest. 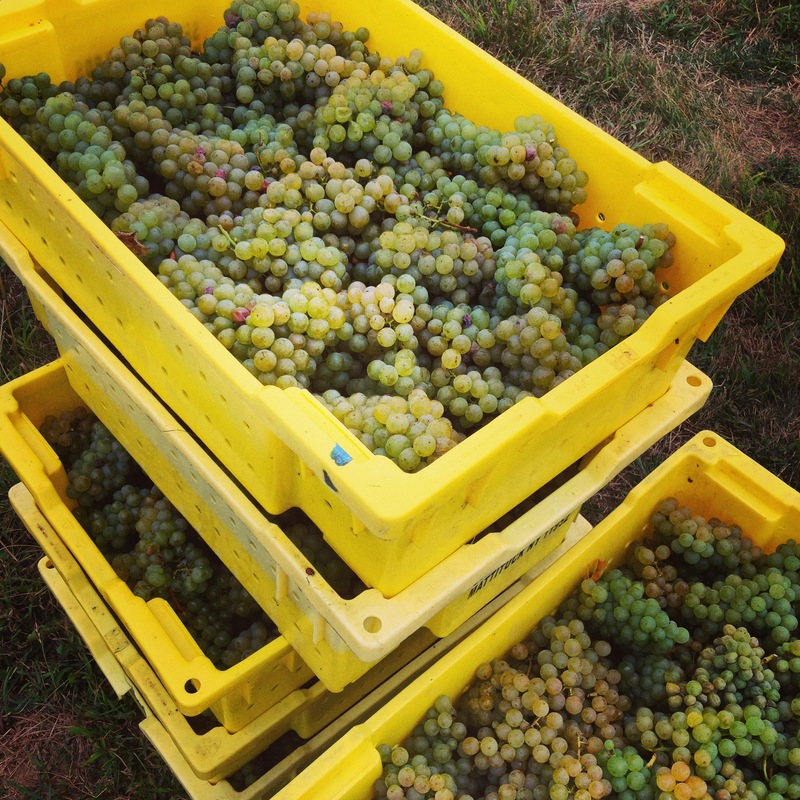 A tractor towing loaded bins of Sauvignon Blanc grapes shuttled back and forth from the crusher beside the tasting room to the south block of grapes that were being picked. We split a 6 wine tasting: a steel aged chardonnay and an oak-aged white blend of Sauvignon Blanc, Semillon, and Chardonnay, then a Merlot blended and a 100% Merlot, then and a Cabernet Sauvignon and an unusual 100% Petit Verdot (usually used to add structure to a blend). Tasting the succession of wines gave me the spectrum of the aesthetic of the winemaker; interesting, restrained, sophisticated. Again, the thing that struck me, especially with the Merlot, was the dramatic difference between the grapes grown and wine made in California and what we were tasting. Wine has more of a reputation for reflecting its terroir, so while the differences between grapes were less of a revelation that my observations about beer, the difference between the Merlot we tasted and many of the Merlot we had in California was incredible. I have tended to avoid Merlot, often finding it very flabby and dense, like a down comforter for your tongue. This Merlot, while still lush with the fragrance of fruit, had a little crackle of herbs and structure and a burr of tannin that lifted the wine from stodgy to vibrant and thought-provoking. My take away: don’t dismiss a grape varietal because the way it is grown and treated in one region displeases you; give it a second and third chance from other regions. You may be as pleasantly surprised as I was. I bought two bottles to take home! Back to the beer. 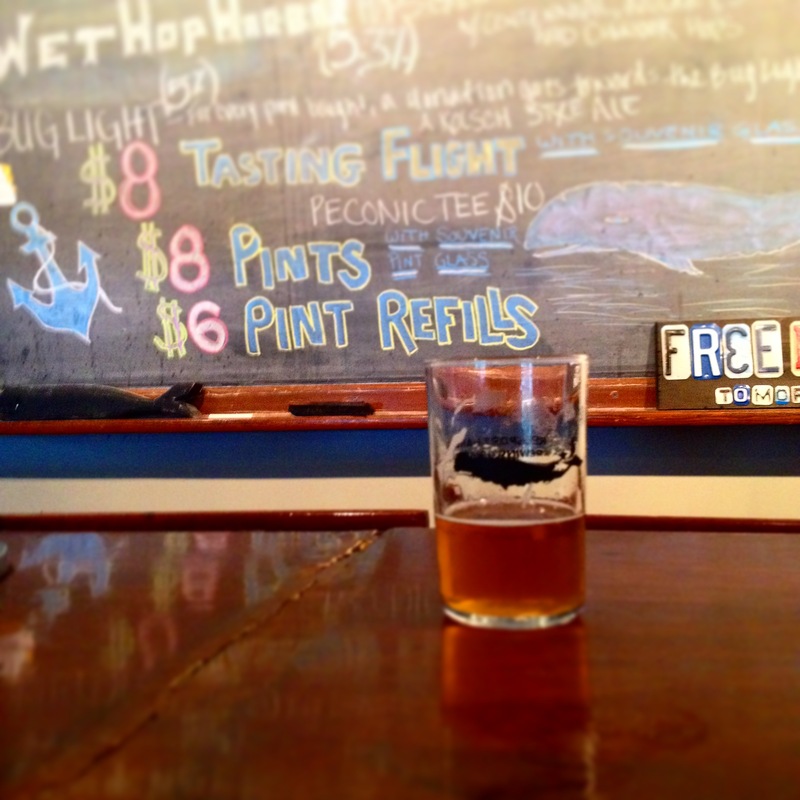 We were able to visit the tasting rooms for both of the local breweries over the next two days. Tasting a flight of beer by a brewery is a great way to get the same sense of the brewer we got from our wine tasting. One of Greenport’s brewers just happens to be a local hops farmer, so their beer was more aggressively hopped than many I’ve tasted in the north-east but still with a distinctive bass note of toastier malts that I think of as having English beer roots than a comparably hopped west coast beer. They don’t bottle their beer yet, so we had to forgo bringing any home with us but Montauk Driftwood Ale was for sale in the 7-11 so we got a six-pack to bring home. The thing about road tripping is all the stuff in-between where you start and where you end up the add the tones and highlights and shading to the big picture. Flying from one big city in America to another is great but I’ve picked up so much of those little bits of accents, the subtle variations that tell you you’ve entered a new place. I remember my last cross-country drive, getting out of the car to switch drivers, taking a breath, and realizing I wasn’t in the West anymore. I love when I run across a favorite beer or bottle of wine from back in California, but I’m also loving that I’m starting to pick up on the accent of the things I’m tasting here too. I spent most of August house sitting in western Massachusetts. I happened to discover that the aunt of a good friend would be travelling and needed someone to stay in her sweet 200 year-old cottage in the Berkshires and take care of her cat. And as anyone who lives in The City knows, August is the time of year when the air starts to reek of hot garbage and humidity, so anyone with half a chance to be elsewhere decamp to more balmy climes. 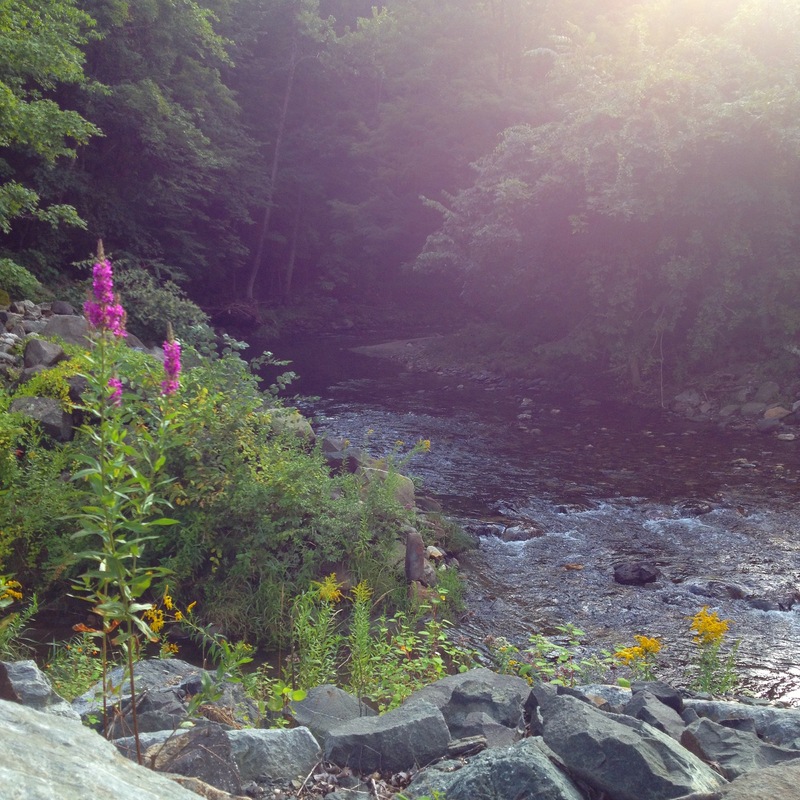 I spent the months before planning my time in the country, looking forward to hiking, biking on the rail trails in the Pioneer Valley, canoeing and swimming in the clear cold rivers, visiting farmers markets, cooking from the garden. I took Amtrak’s Vermonter up from Penn Station to Springfield, Massachusetts on a Thursday evening. 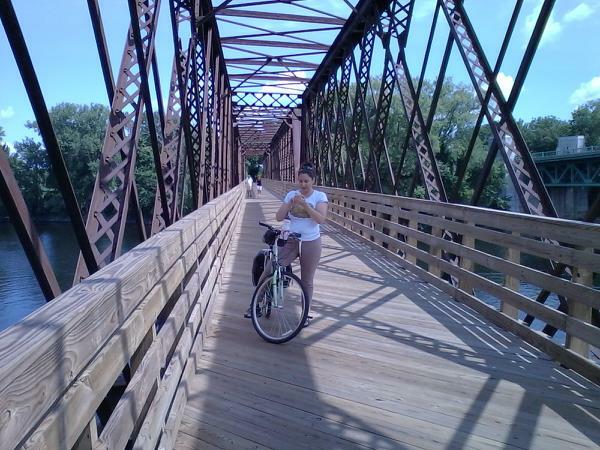 The first thing I did the next morning was go for an 18 mile bike ride from Easthampton, through Northampton, across the Connecticut River into Hadley and back. The second thing I did was break my ankle. I was walking up a slick slab of rock beside the South River up in the mountains. I had gone up to the house to get the “tour” before my friends left for their flight, and while checking out a secluded local swimming hole with my friends’s aunt, felt my ankle just go from beneath me. I went down on my hands and knees feeling like a roaring black cloud had just bowled me over. My brain wasn’t allowing for a lot of pain, just a survival rush that almost blacked me out. How was I going to get up the trail and to the car? I steeled myself, trying to still my mind enough to figure out a way out. When the fog began to clear, the roar of blood in my ears receded so that I could hear the waterfall beside me and I found a limb to lean on up the trail to the car, I tried to decide what to do next. Two things were going through my mind: my belief that if I was able to walk at all, it must be a sprain and not a break and might heal quickly, and my determination to enjoy this time away from the city. I was alone in an unfamiliar area with an unfamiliar injury so I decided to grit my teeth through a trip to the grocery store and hole up at the house with lots of ice and ibuprofen for the next few days to see if this were a short-lived problem. 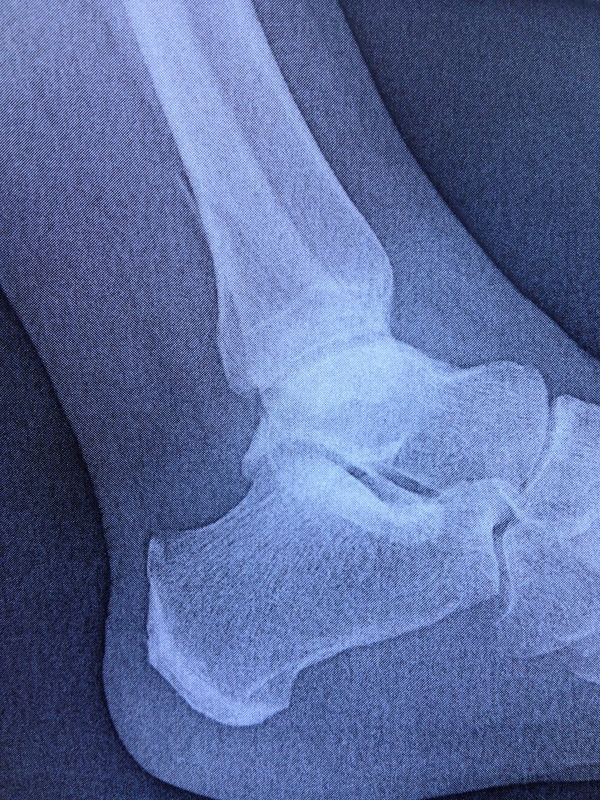 As it turned out, it wasn’t, but despite the swelling, insistent pain, the massive bruising, I hobbled around for the next 3 weeks until I got home and my orthopedic doc, grimacing and shaking her head, told me that the reason I had been so uncomfortable was that I had been walking on a broken fibula. It’s almost 6 weeks from the break now and I’m healing well. 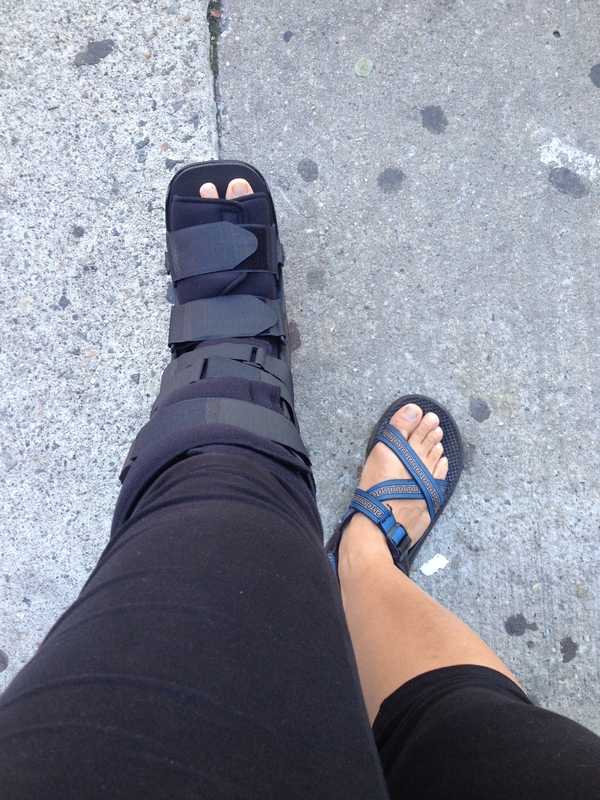 I just transitioned from a massive knee-high Velcro boot to a smaller brace and a prescription for physical therapy. I should be able to walk around more easily with the smaller brace, which is a relief; being car-free is really difficult when one of your legs is out of commission. The bone had already begun to knit together and did not need to be re-set. It’s more of a dull ache and an inability to move my foot at this point. Despite it all, I actually did have a good time in the Berkshires. 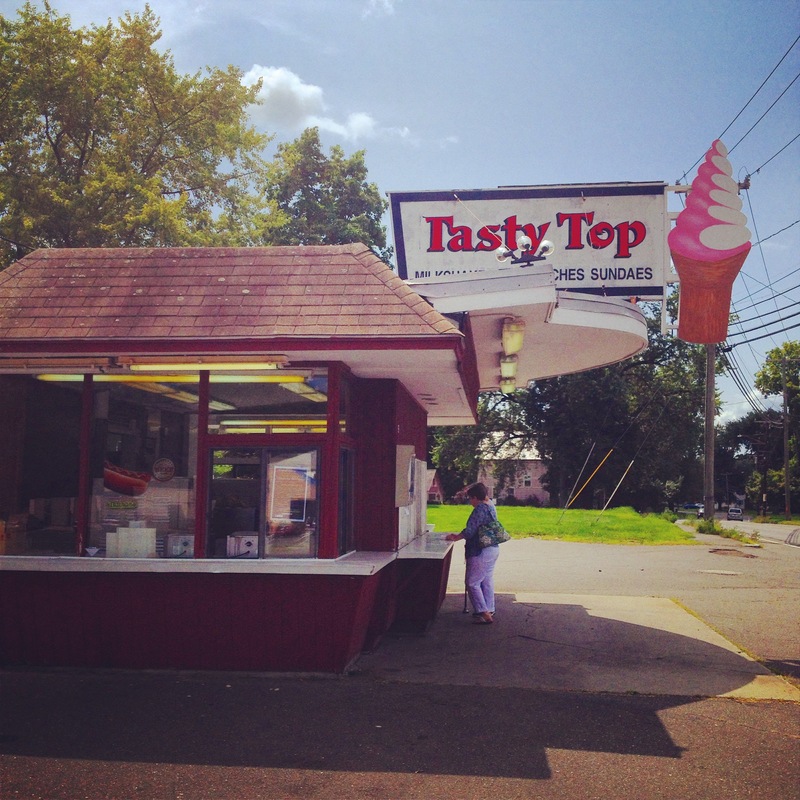 The first week I was alone, I explored in the car, turning down any lane that looked interesting, driving through pretty New England hill town. 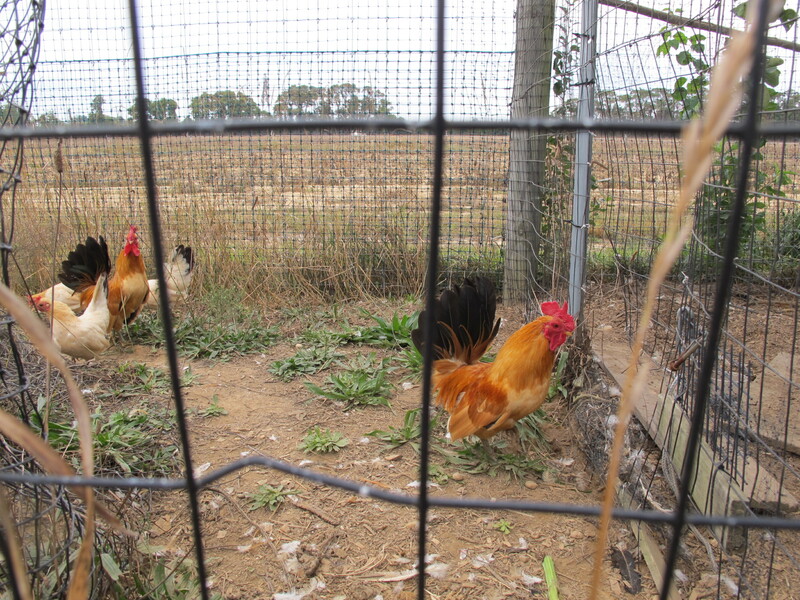 I visited a great horse-powered farm with a CSA and farm store for produce. I sat on the deck in the sun and read, foot in a bucket of ice or perched on a pile of cushions on a chair. I sketched in the art studio in the house, watched the river, cooked. After Scott arrived the next Friday I was able to do a little more with his help; we went to farmers markets and found some good breweries, restaurants, and roadside stands. 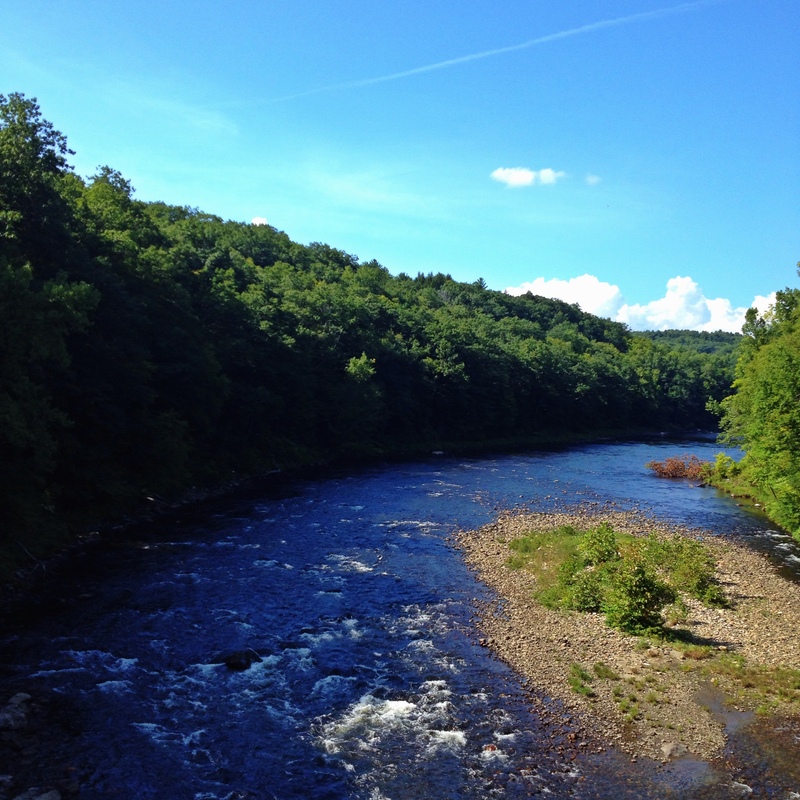 We cooked together and drove out to Stockbridge to the Norman Rockwell Museum and up to Williamstown and back across the beautiful Mohawk Trail. It was beautiful and peaceful in spite of my pain. I feel a little queasy thinking about what I did, walking in the grass, in the river, through the grocery store on a broken fibula for 3 weeks, but I’m glad I was able to spend time up there. It’s one of those places that combines the serenity of natural beauty with the culture of university towns, some notable art museums, and a really strong emphasis on good, well-made food and drink. While I wasn’t able to write the posts I had hoped to while I was there, I did put together a Google map of places we visited, restaurants, farmers markets, as well as some practical stops like grocery stores. I’d like to go back and get a little more of an active experience next time, visit more restaurants, and the Museum of Contemporary Art in North Adams, so I’ll probably update this map over time. 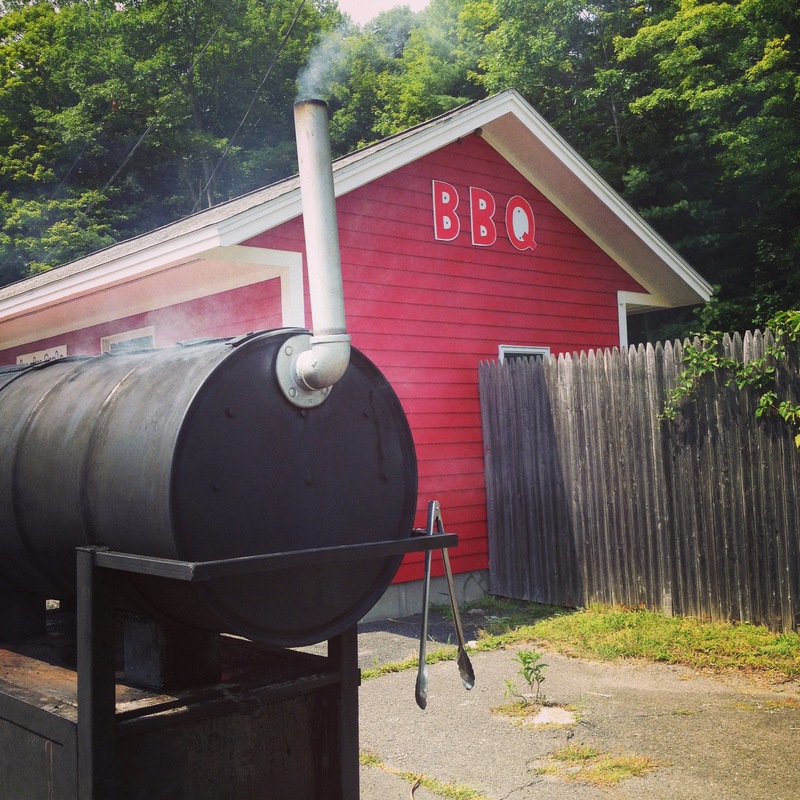 There is a lot still to be explored in the Berkshires. Apparently, Winter is never going to end, my lips are never going to stop chapping and peeling, my flourescent-white legs are never going to see warm sunlight, and I am never going to have to think about wearing any garment that is more revealing than a down puffer coat that gives me the svelte figure of the Michelin Man. So I’m thinking why not just go all out Winter comfort food like slowly braised meat sauces enveloping homemade egg pasta and showered with a blizzard of parmesan cheese. 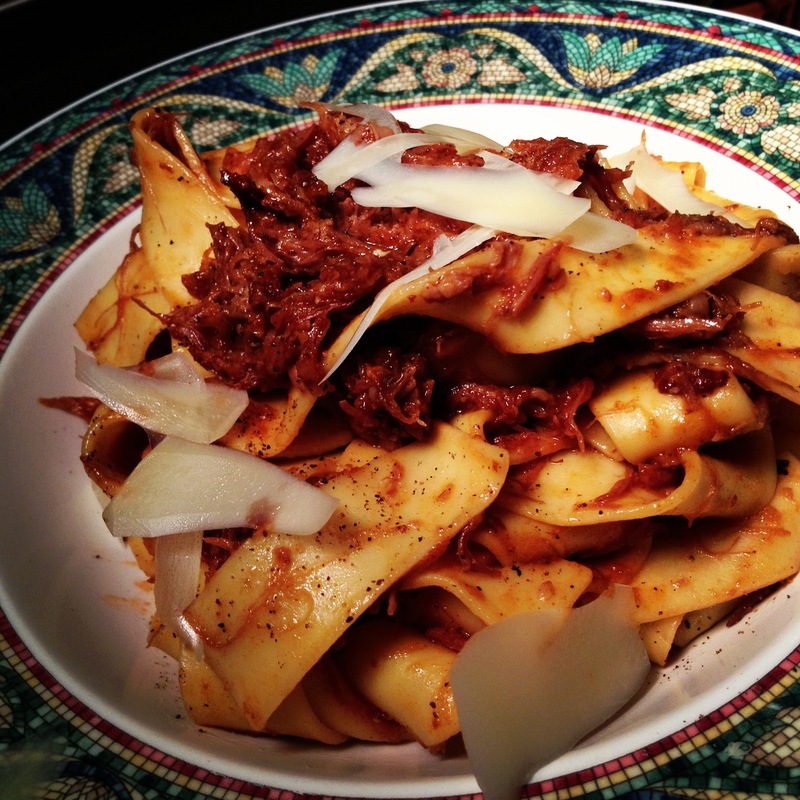 My hands down favorite slow braised meat sauce is this pork cheek ragù. Made out of the flavorful little medallions of cheek in the middle of what southerners would call hog jowls (and when cured, what Italians call guanciale), pork cheeks are tough little morsel of flavor that slowly braise down into the richest, most lip smacking, pasta coating, clingy, delicious sauce. As when you make a good stock with the collagen filled parts of a chicken so that the stock is rich and silky without being fatty, pork cheeks break down with slow cooking to dissolve the tough protein and collagen into a sticky mahogany sauce. Pork cheeks can be a little hard to track down in a regular supermarket meat case but they are definitely worth asking around for or ordering from a farmer or butcher. I can always find them at Eataly in Manhattan, and since they aren’t a super mainstream cut, they are pretty inexpensive. The sauce freezes really well so it’s not a bad idea to make a double batch when you have a chilly afternoon to spend indoors. Unwrap the pork cheeks and completely dry them with a paper towel. I usually get pretty well-trimmed cheeks, but if you see lots of pieces of fat, trim the big chunks. In a sauté pan or shallow soup pot, heat a splash of olive oil to a shimmer over medium heat. Carefully place the pork cheeks in a single layer in the oil. Salt and pepper, then flip them with tongs and salt and pepper again once the first side is golden brown. Once both sides of the pork are brown, take them out of the pan and set them aside. Drain all but about 1 tablespoon of fat from the pan and lower the heat. Add the onion, garlic, and carrot to the oil and sauté over low-medium heat to soften them and remove any brown bits of fond from the bottom of the pan. 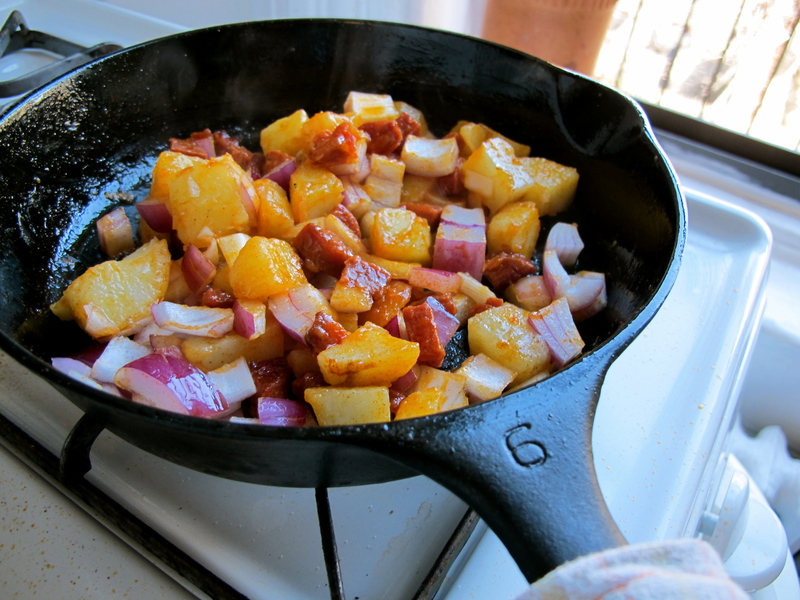 Once the vegetables have softened, scrape them to the sides to make a space in the center of the pan. Add the tomato paste and harissa to the pan and let it sizzle for a minute or two, stirring gently to cook the pastes together. Stir the paste and vegetables together and add the wine. Bring it to a boil and stir to release any browned bits from the pan’s bottom. Cook until the smell of the wine mellows. 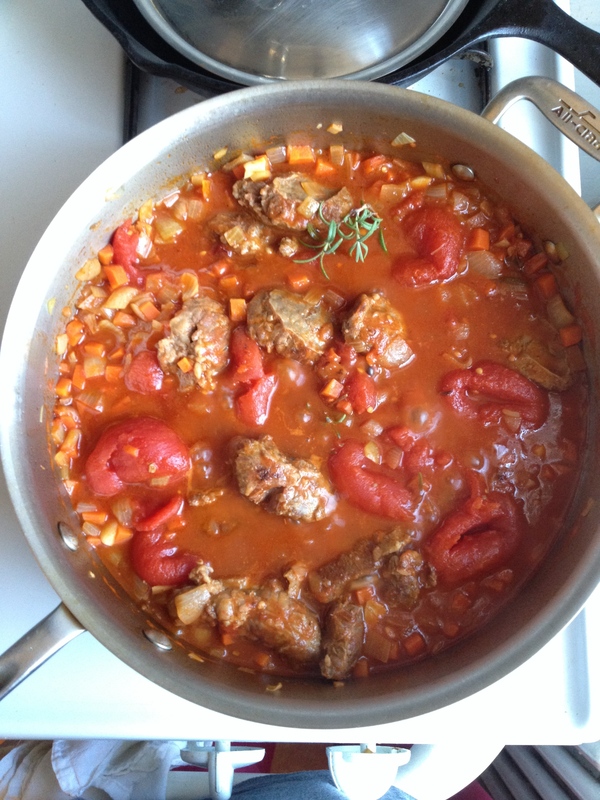 Add the pork cheeks, can of tomatoes, bay leaf, and rosemary. Bring to a slow simmer. 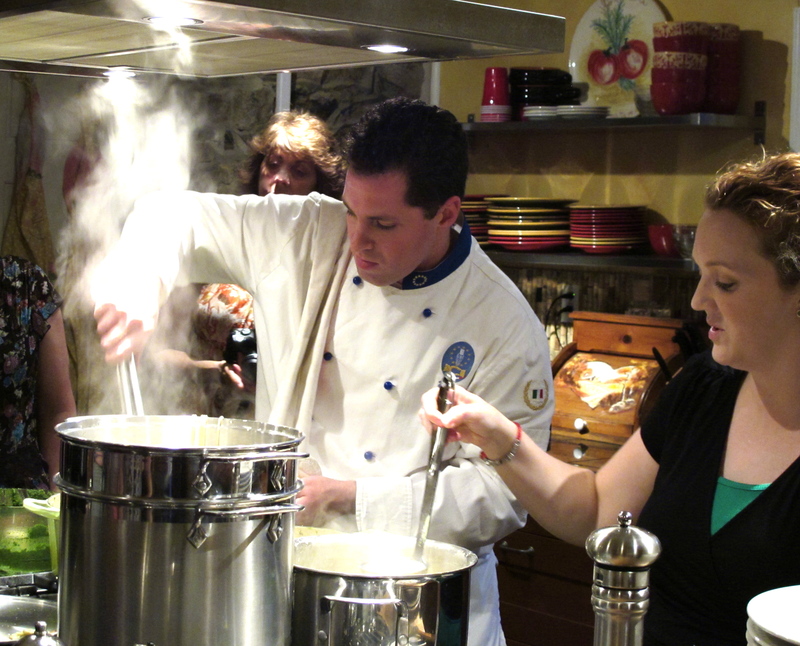 Cover and lower the heat to very low, just enough to maintain a low simmer. Cook for at least and hour until you can easily break the pork cheeks up with a spoon. Once the meat is tender, remove the sauce from the heat. Remove the bay leaf and rosemary stem. With a pair of forks or a flat edged wooden spoon, crush the pork and tomatoes into coarse chunks. The sauce should be very thick and sticky. Toss with pappardelle pasta or pour over parmesan-infused grits. With a vegetable peeler or coarse cheese grater, shave slivers of parmesan over the top. 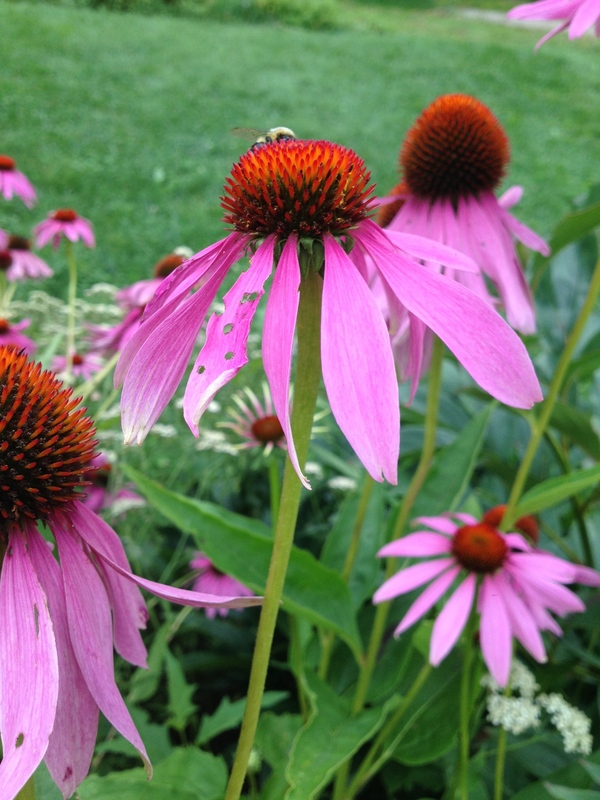 Alliums are the plant family that includes onions, garlic, chives, leeks, shallots, and scallions. There are two broad categories by which I divide types of alliums: plants cultivated for their roots and plants cultivated for their tops. Bulb onions are part of the foundation of most cooking. They are part of the French mirepoix, the Creole and Cajun holy trinity, Spanish sofrito; from West Africa to India to Germany you find onions as one of the basic flavor of nearly every culture’s cuisine. The common, everyday onion is cultivated for its round bulb root, as are shallots, cipollini onions, sweet Vidalia and Walla Walla onions, and red, yellow, and white onions. The bulbed spring onions sold in bunches with green tops intact are bulb onions that have been thinned out or harvested young. Bulb onions tend to have tough green tops which are typically not eaten. 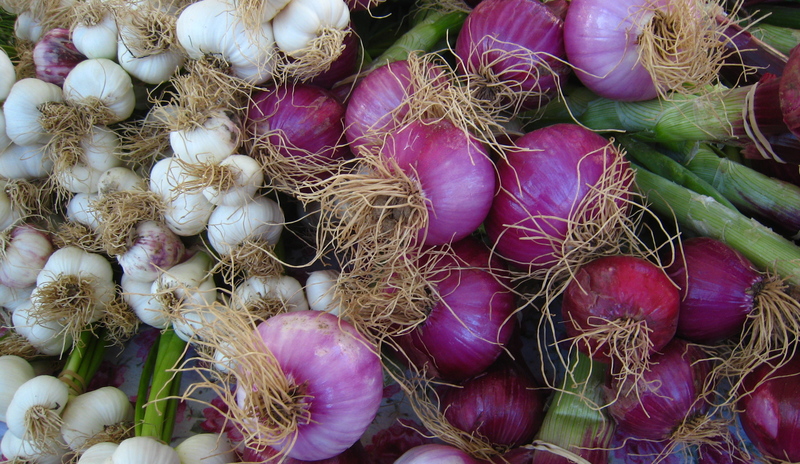 Bulb onions are harvested and dried before being used since moisture can cause them to rot; sweet onions like Vidalias have a higher moisture content than their more pungent cousins which makes them more perishable. That difference is also something to take into consideration when you choose which onion you will use; if you don’t want extra water releasing from the onion into your food, you need to either choose a dry variety like the white or yellow onions you find in the grocery store or cook the moisture out first. Dry bulb onions can be kept in a cool dark spot; sweet onions, garlic, and spring onions will keep better in the bottom drawer of the refrigerator. 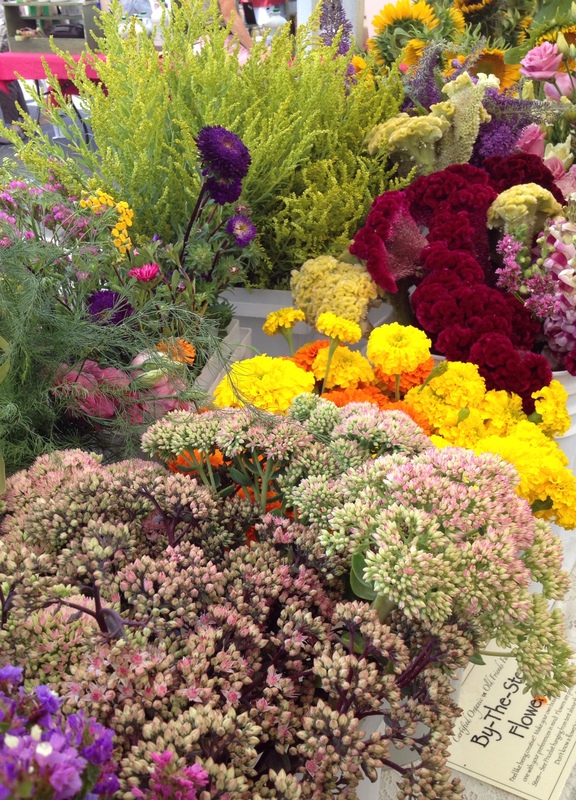 Alliums grown for their tops and flowers are used more as herbs, fresh and raw, used as a more delicate flavor enhancement at the end of preparation than cooked into a dish. Chives and scallions are cultivated primarily for their green tops; their milder flavor and tender greens make them more palatable raw. Chives, scallions, and garlic chives, are delicate and much more perishable than bulb onions, so keep them wrapped in a paper towel in a bag in the crisper drawer and use them within five days or so before they wilt. Leeks are a bit of a middle ground allium. 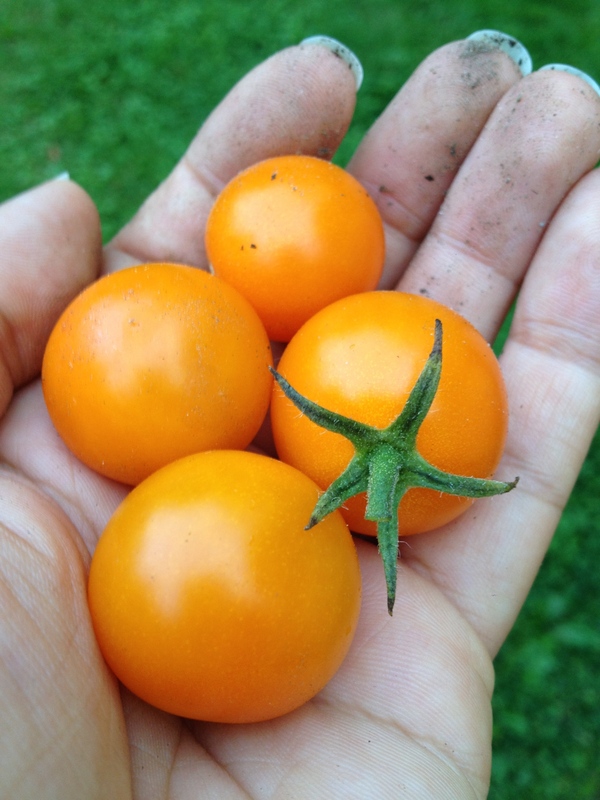 They have a delicate savory flavor but are usually used cooked, their tougher upper leaves trimmed. They have the slender shape of a scallion with no bulbous root at the end but are not harvested young like scallions. The pungent heat from any allium can be tempered in one of two ways: with a soak in something acidic like vinegar – shallots in vinaigrette for example – or by the application of heat – garlic roasted to sugary sweetness. I hope this was a good overview from which to start getting to know such a ubiquitous plant family a little better. The Dave Brubeck Quartet’s “Unsquare Dance” is accompanying the pictures. Have you ever had a friend visit one of your favorite places – say, San Francisco or New York City – and spend all of their time in the worst areas – say Fisherman’s Wharf or Times Square – and leave with a terrible impression of that place – crowded, over-priced terrible food, kitschy and touristy? It’s frustrating. While you know that there is so much more to San Francisco than Madame Tussaud’s and t-shirt shops, it can be hard to overcome that negative first impression, however unjustified. That sums up my feelings about okra. 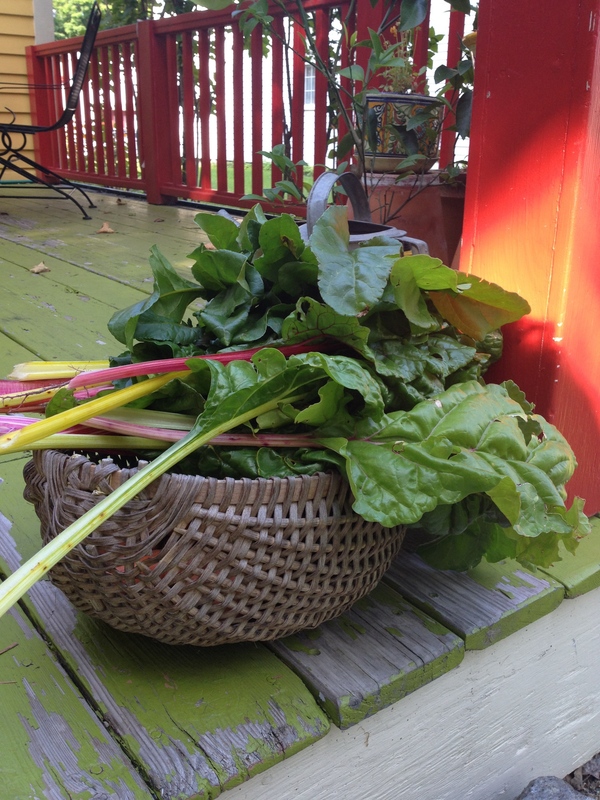 One of my favorite vegetables, it has a terrible reputation based largely on misunderstanding and poor preparation. Is okra slimy? Well, yes and no. Depending on how it is handled and prepared, it can either look like a creature from Alien or it can be as silky and soothing as good stock. Can it be prickly and stringy? Yes, if you get mature, past-their-prime pods. But all of these are easily avoidable disasters. So, if you’ll let me be your tour guide, I’ll try to give you a better second impression of okra. 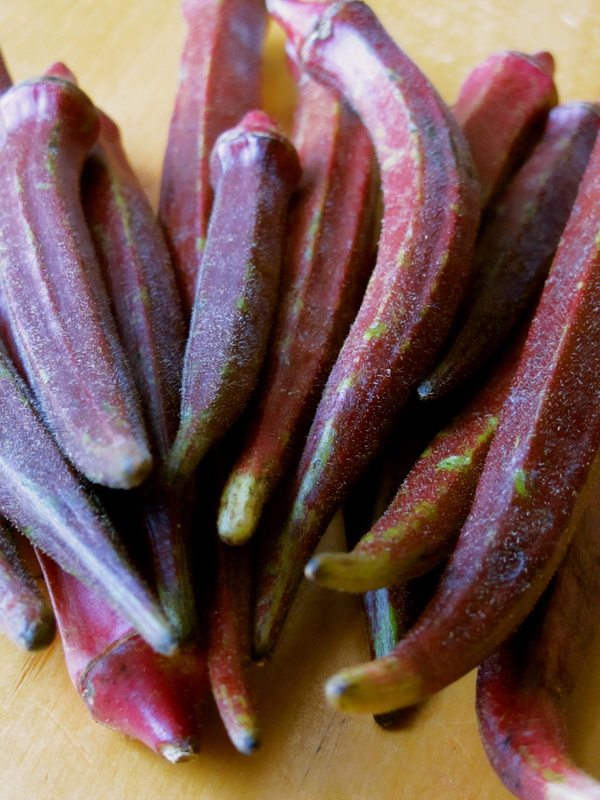 I remember when I was little, my mom handed me a tiny tender okra pod to taste straight from the garden; it was still warm, easy to bite and chew, tender and velvety. It was a perfect little ripe okra pod, bright green and pliable, probably about the size of my thumb now. I prefer cooked okra, but they should be edible when raw, not tough and sharply ridged. As with most fruits and vegetables, there is a tremendous difference between “ripe” and “mature” okra. Ripeness is the peak of flavor and tenderness before the plant begins putting all of its energy into producing and protecting viable seeds. Think about the difference between an English pea pod and a flat snow pea. The English pea shell has matured into a case to protect the peas (or seeds) inside while the snow pea is still juicy and tender, immature but ripe. Since okra is not eaten mainly for its seeds, I want the outside to be tender like the snow pea rather than the English pea. Okra is a sensitive little thing, easily bruised by over-handling, so a good indication of freshness is whether the tips and ridges are blackened by much squeezing and tossing. If you buy okra in a farmers market or grocery store that serves an enthusiastic okra-eating demographic like Indians, West Africans, or East Asians, you will probably see shoppers standing beside the bin rifling through the pile feeling each individual pod in order to get only the best. If an okra pod has been passed over often enough so that it gets bruised like that, walk away. The experts have spoken. 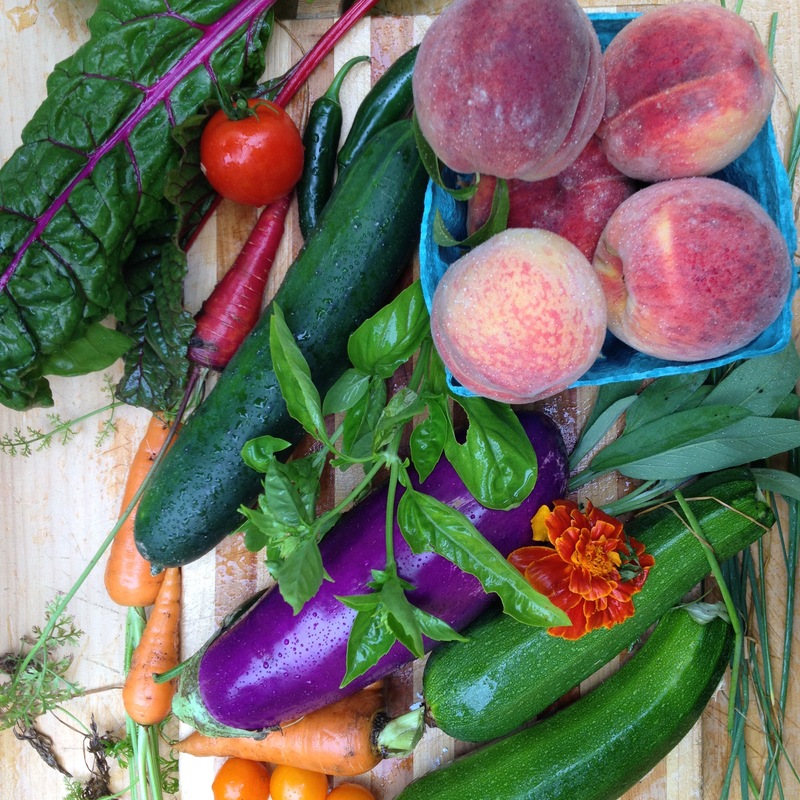 If you come across a pristine pile, go ahead and start feeling up the produce. Gently pick up each bright green pod that looks to be about the right size (think a ladies thumb) and give a little squeeze to see if it feels spiny and rigid or tender and pliable. There will be a light fuzz on the outside and they shouldn’t feel dry or brittle. The tips should be intact and not black and battered looking, and a little bit of stem on the other end keeps them from drying out too quickly. As long as they are not damp, they will store for a few days in a bag in your crisper drawer. 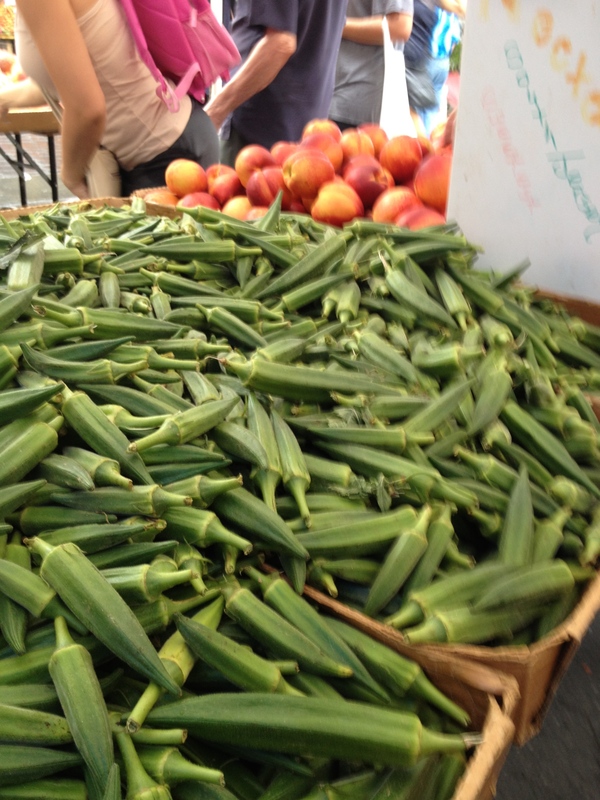 There are two exceptions to the size and color rules: First, there is an okra variety called “cow horn” that is much larger than other varieties while still being ripe rather than mature. If a seller can assure you that the large variety you are looking at is indeed the cow horn type, go ahead and try it, but if they are uncertain, don’t bother buying their okra. There is too much risk that you’ll end up with something that tastes like balsa wood. And then there are some gorgeous bronze and burgundy varieties of okra (like the ones in the first picture)that I like to try when I find them. They are less common though, so I would stick with green until you get comfortable and then branch out to more exotic types. Now, before I get into any discussion on preparation, let’s talk about slime. Like I said, okra can be really slimy, depending on how it is cooked and handled. But why? What is it that turns a velvety little pod into something that looks like the Creature from the Black Lagoon? In a word, fiber. Okra contains a soluble fiber charmingly known as “mucilage.” Some other foods that contain mucilage are aloe vera, nopal (or prickly pear cactus), kelp (or kombu), chia seeds, flax seeds, and oatmeal. And just like aloe vera gel is soothing and healing to the skin, this type of fiber is very soothing on the inside. During his recovery from orthognathic surgery a few years ago, Scott had a reaction to anti-swelling steroids he was given that caused a lot of stomach pain. One of the few foods that he could swallow that soothed his stomach were homemade miso soup (made with kelp) and stewed okra. This soluble fiber is also helpful in controlling cholesterol, regulating blood sugar, and keeping the digestive system healthy as a probiotic. Rynn Caputo and I met because she made a provocative comment about mozzarella on Twitter. Fresh mozzarella is the stuff of legends in Hoboken NJ but is something I have only become familiar with recently. Every deli worth its salt has bowls of white, milky “mutz” waiting to be sliced into creamy slabs for giant sandwiches or tomato and basil salads. So when Rynn tweeted in response to Josh Ozersky’s article “Masters of Mutz” about where to get the best mutz in New Jersey by saying basically “too bad none of it is real mozzarella,” I was intrigued. 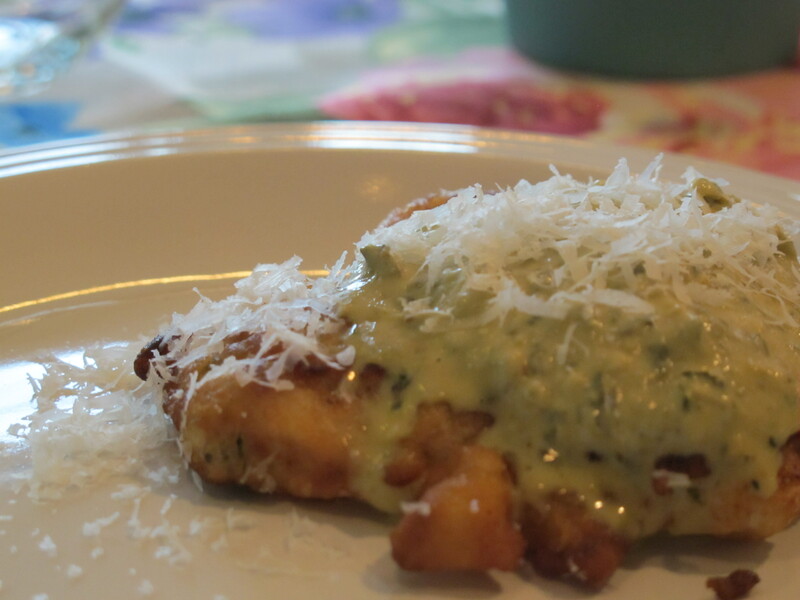 She explained that almost all commercial American mozzarella curds are formed by adding an acid to milk rather than a more time-consuming rennet set which actually cultures the milk, eats the lactose, and gives the curds a richer and more tangy flavor. (I think she actually said “if you add acid to grape juice, it doesn’t make it wine.”) She and her chef husband Dave had recently started Caputo Brothers Creamery in Spring Grove, Pennsylvania where they make the more traditional Italian fresh cheeses with cultures, and she invited me to a cheese stretching demo that she was holding at The Cheese Store here in town where she would be able to explain the process and differences more thoroughly. You can’t go to a Rynn Caputo cheese stretching demo without catching some of her infectious enthusiasm for artisan cheeses and Italy, and she supports her enthusiasm with a thorough knowledge of her topic. Since I am fascinated by fermented and cultured foods, I peppered her with questions during her demo. By the end of the afternoon we had decided that two girls who love cheese as much as we do should be friends, and she had invited to me to come out and make cheese with her at the creamery, and to bring Scott out for one of the farm-to-table dinners that she and Dave host in their home. 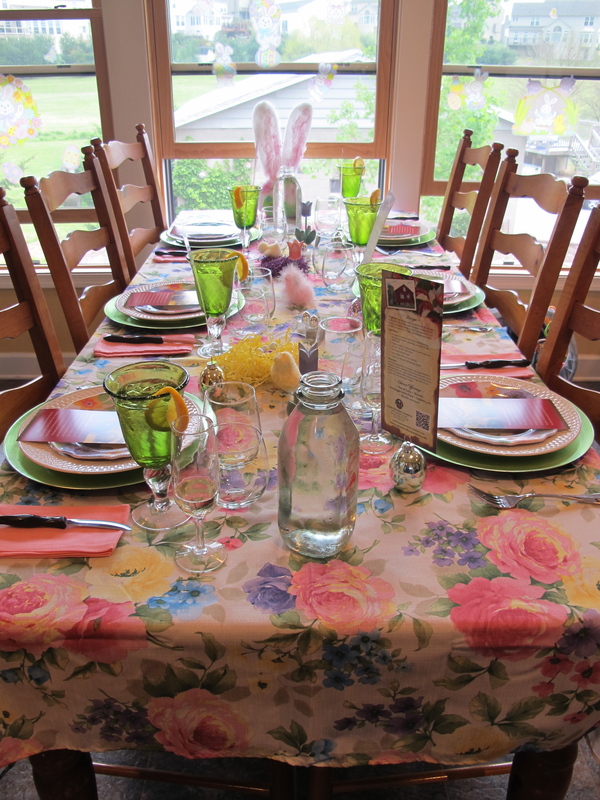 So a couple of weeks ago, we found ourselves out in the Kodachrome green Pennsylvania countryside at the Caputo’s old stone farmhouse with a dozen or so friends and neighbors eating a mostly locally sourced Spring feast. 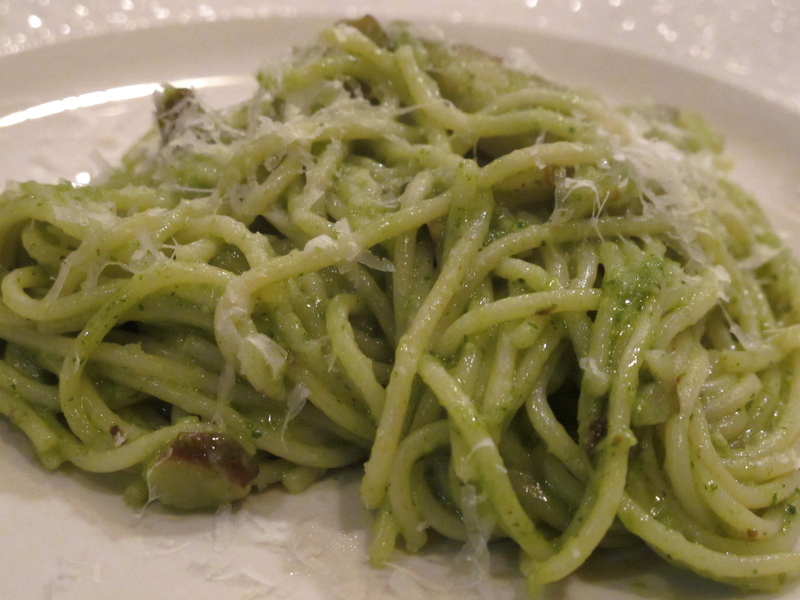 Sunchoke pasta with sauteed sunchokes and dandelion green pesto. Everyone brought bottles of wine to share and one guest who owns an olive oil and vinegar shop brought a couple of bottles of olive oil to taste, an Italian and an Argentinian oil. 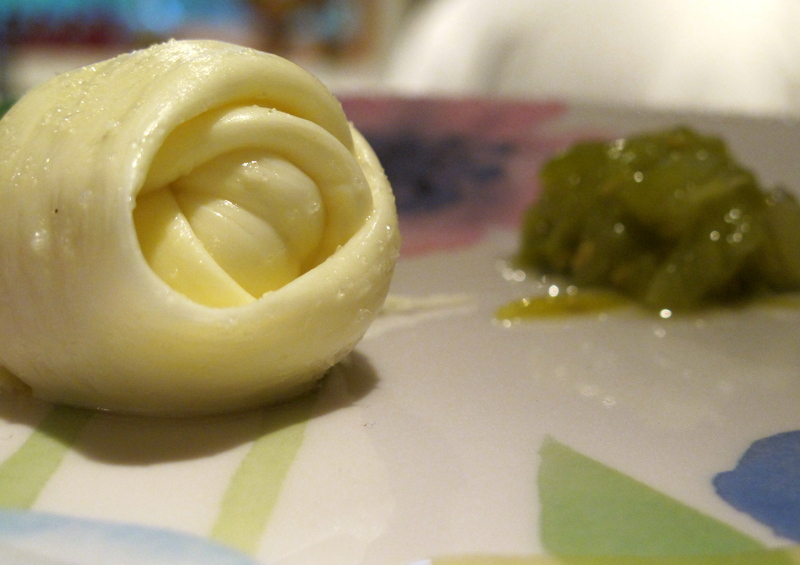 Once we had tasted both and decided which we preferred, we drizzled the oil over our fresh cheese that Rynn stretched and rolled for us. I’m looking forward to getting back out there soon to actually make cheese, rather than just consume it (although that’s not a bad idea either). When I do, I’ll fill y’all in on what I learn. Just a word of warning: if you tell a butcher that you need “enough sausage for two people”, the two people he has in mind are not you and your lovely spouse, but two hungry offensive linemen from the Chicago Bears. And by the time you realize his misapprehension, he has already cut, wrapped and bagged your sausage. All that is left is to lug your giant bag of sausage home, use it for its intended purpose and then start figuring out other clever ways to use the rest. Not an unpleasant task, I know. 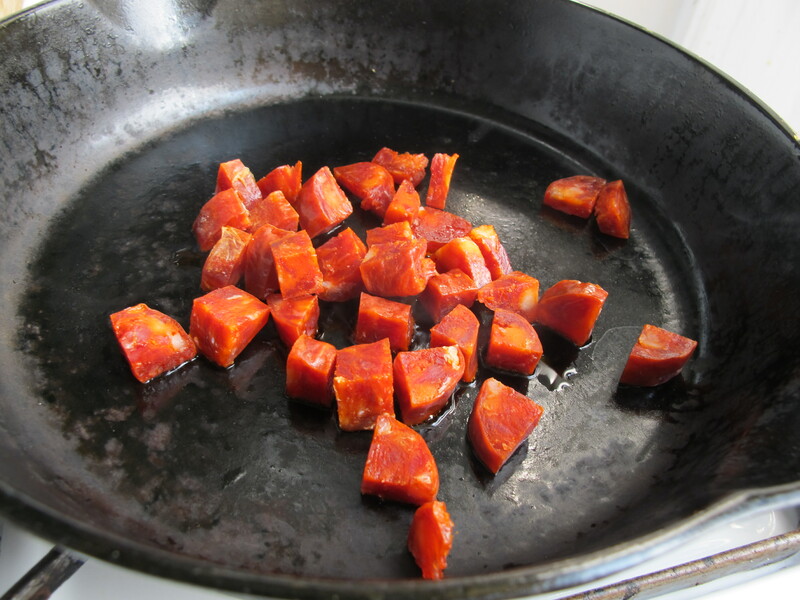 Spanish chorizo sausage and its cousin Portuguese linguica are, basically, awesome sauce-age. They are typically dried, kind of like a salami, although some are softer than others, and are intensely flavored with delicious things like smoked paprika and garlic and chunks of pork fat that melt out when they are heated, flavoring everything with porky, sausagy deliciousness. Since I had made this bulk purchase of sausage to make a seafood paella last week, I had a bit of a Spanish theme going on in my mind: what could I do with a jar of fire roasted piquillo peppers, sausage, some onion, and my smoky piquante Spanish paprika? 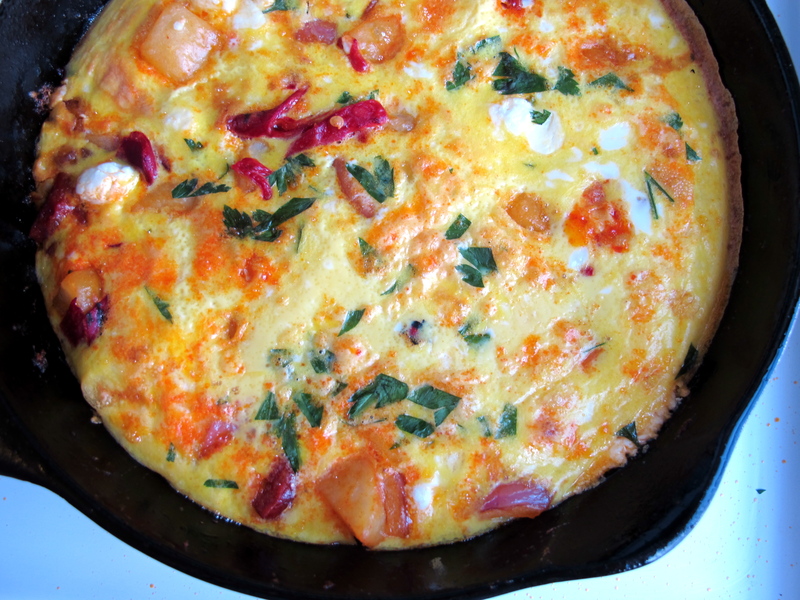 Make one of my favorite quick suppers, a Spanish frittata. All I needed was some cooked potatoes, eggs, and soft, creamy, tangy chevre. 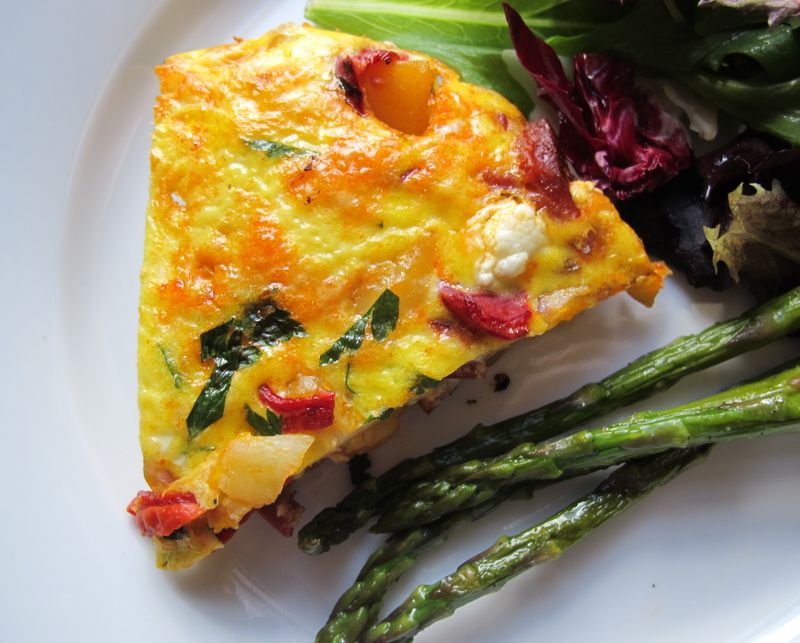 A frittata is an open-faced omelet with vegetables, cheese, and meat mixed into the eggs rather than being folded in after the eggs are mostly cooked. My frittatas tend to be heavy on the fillings. 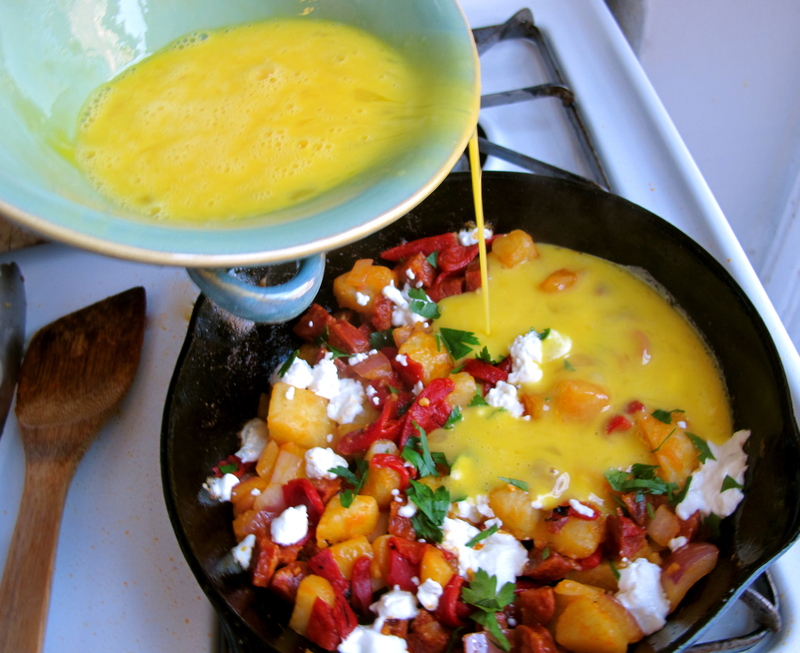 And while this recipe is one of my favorites, a frittata is just as adaptable to what you have on hand as an omelet is; the important thing to bear in mind is that (and this is especially important if you, like me, like a lot of fillings) you must pre-cook the vegetables before the eggs are added. Raw or undercooked vegetables release a lot of water while they are cooking and that water just makes your eggs awful and soggy. The other benefit to cooking the vegetables ahead of the eggs is that you can add that layer of flavor that a little browning in a bit of flavorful fat provides. The creamy potatoes, sweet peppers and onions, creamy/tangy chevre and smoky sausage give the frittata a full balanced spectrum of flavor. 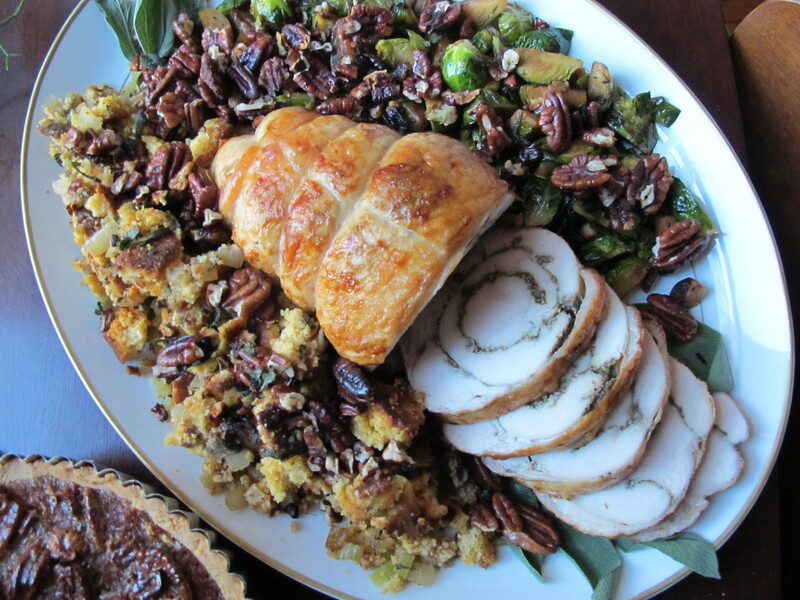 Preheat the oven to 350 or your broiler to medium-high. If you are using a cast iron skillet as I am, use the teaspoon of oil to lightly grease the entire inside of the pan so that the eggs are less likely to stick. I don’t have non-stick, but I understand that if you do, that step is unnecessary. Over medium heat, heat the diced sausage through until some of the orange fat begins to ooze out; add the potatoes and onions and saute until the onion begins to soften and the potatoes begin to brown. Dust everything with smoked paprika according to your flavor intensity preference. Scatter the pan with the sliced piquillo peppers; crumble the chevre into the vegetable mixture, leaving rough chunks of the soft cheese. Toss in the parsley and sprinkle with a little salt. Put a pinch of salt into the beaten eggs and pour them over the skillet, evenly distributing it over the vegetables and sausage. let it cook over medium until the edges become opaque and bubbles begin to rise through the eggs in the middle of the pan. Place either in the oven or under the broiler to finish cooking the top of the eggs. 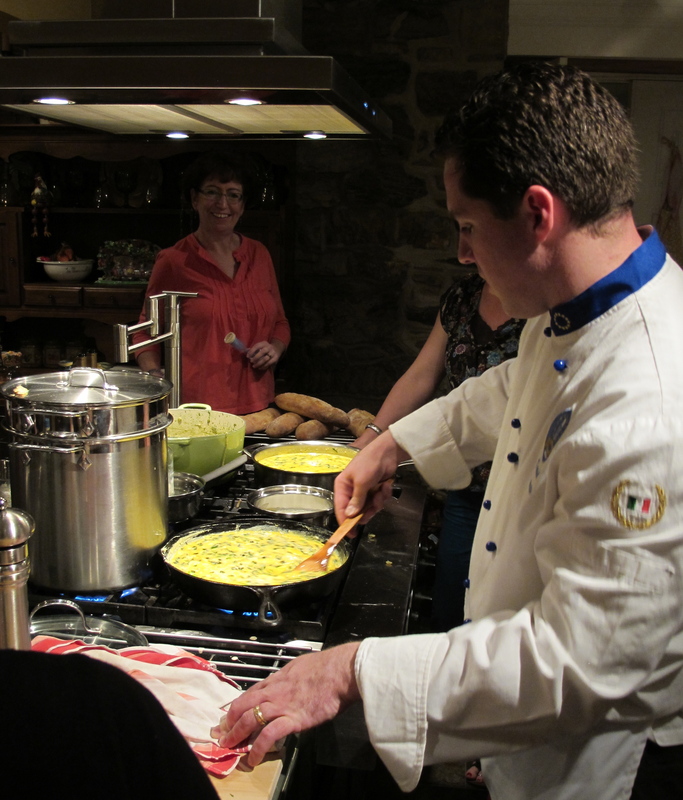 Keep an eye on it; it should only take a few minutes before all of the eggs are opaque and lightly cooked through. Let the frittata sit to cool and set slightly before slicing in wedges; it’s also good at room temperature. 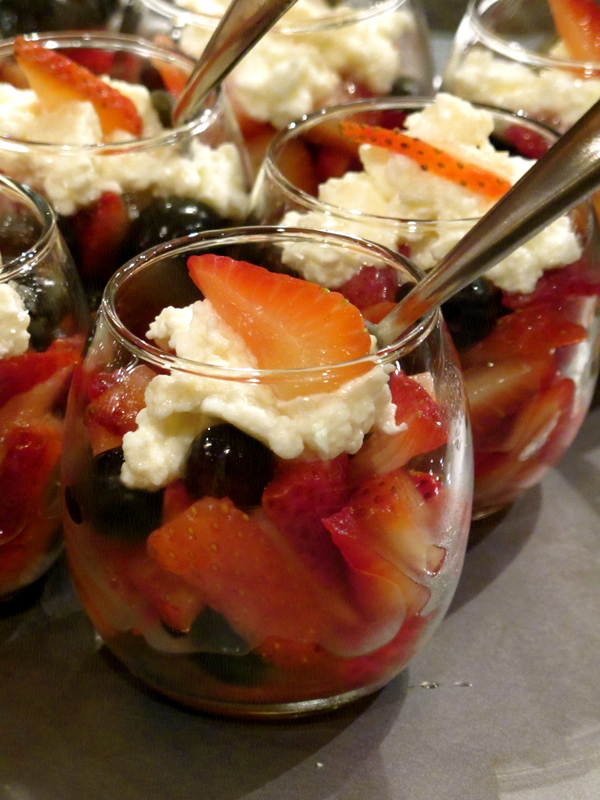 Let’s just say, hypothetically, that you were invited to dinner at a friend’s house and you say “what can I bring?” and it ends up that you’re bringing dessert. And then let’s just say, for example, that you had bought a bag of lemons and were planning to make a lemon tart, but then the crumb crust that you put in the oven while your dear spouse is taking a nap on a Saturday afternoon starts leaking butter into the bottom of the oven and billowing smoke sending you running into the hallway with a towel to frantically wave under the fire alarm in the direction of the kitchen window that you flung open so that it doesn’t go off and wake everyone up. And then just say you are totally out of ingredients to make the crust again and your totally fed up with crusts anyway and are completely over pastry in general and don’t feel like going to the grocery store but are still on the hook for dessert in a couple of hours. What is one to do? Hypothetically, you know. Ahem. Chop the chocolate into little bits. Heat the cream in a heavy bottomed pan until it comes to a simmer. 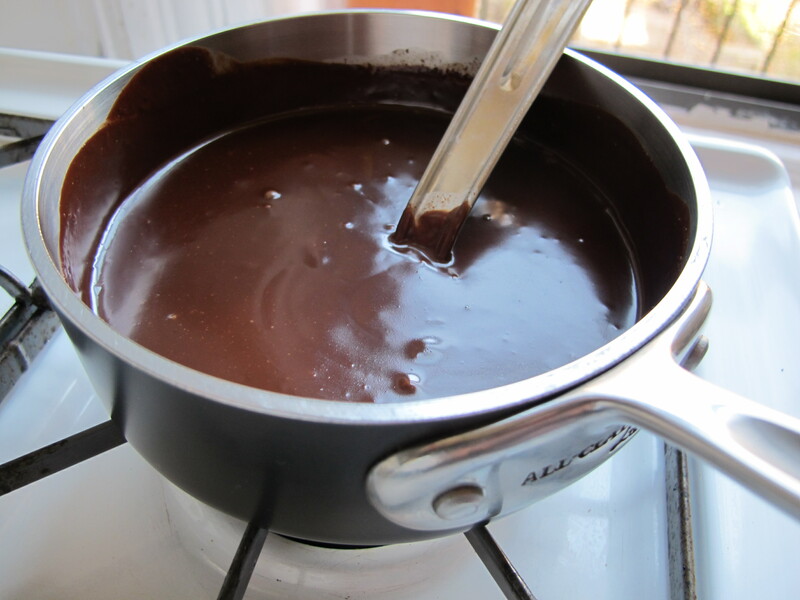 Remove the pan from the heat and pour in the chocolate; let the chocolate sit in the cream for a minute or two and then whisk together until dark and smooth. Beat the two egg yolks together with the sugar and then pour a little of the hot cream into the eggs to heat them up. Put the pan back over low heat and whisk the egg mixture back in. Heat until the faintest wisps of steam begin to rise, stirring the whole time; it should only take a couple of minutes. Remove from the heat and stir in the coffee, rum, butter, and cayenne, whisking to melt the butter and blend everything into a silky smooth custard. 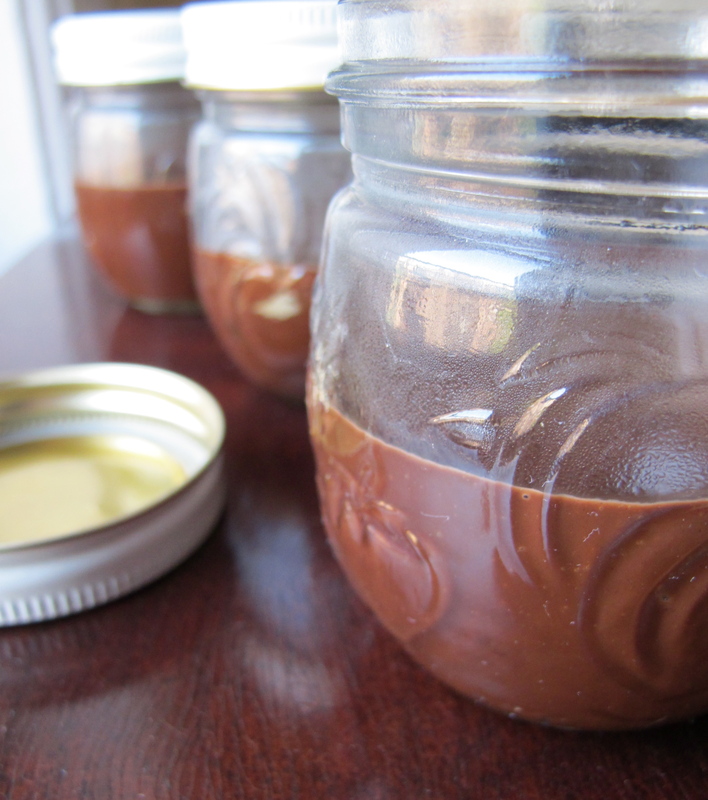 Pour the hot custard into small bowls, espresso cups, or ramekins (I used little jam jars) and allow it to cool. Because this is such a rich dessert, it only takes a small amount to satisfy; and because of this richness, it’s best not served cold, but at a softer, silkier room temperature. 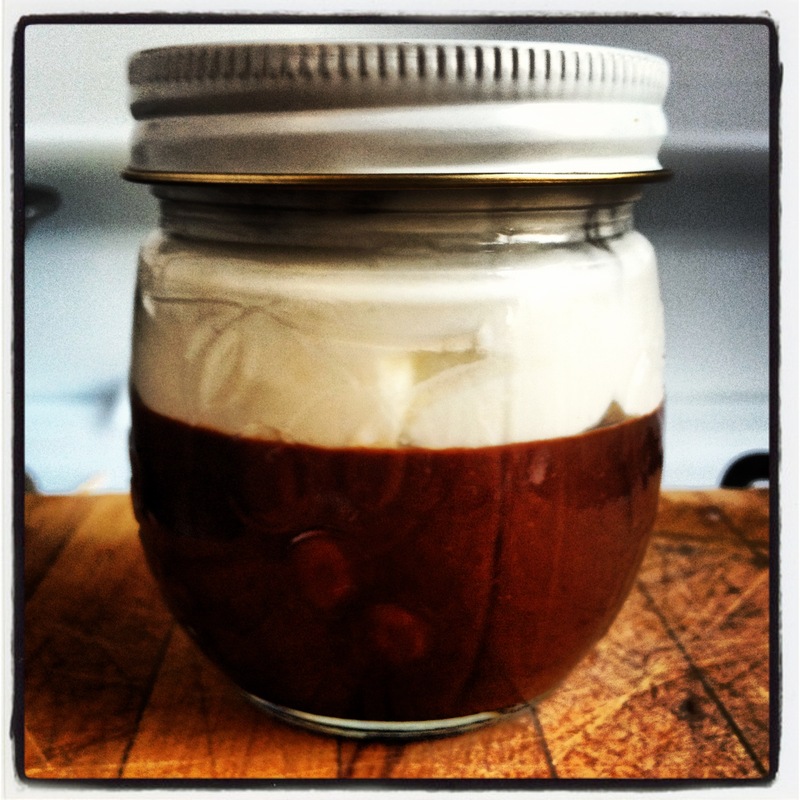 Top with a generous drift of sweetened whipped cream. *I whipped the cream with sugar and a splash of rum and vanilla extract. The contrast of airy vanilla scented cream and meltingly truffle-like chocolate is heavenly.